You are here: Home / Blog / Contest / Would you like to play a game? 1: Give away a bunch of little laser-cut Arduino protectors. Attached to the bottom of the otherwise-bare Arduino board, this is a cheap-and-cheerful way to avoid short circuits when absentmindedly setting the board down. 2: Tease some of the clever folks in the audience into playing a little puzzle, which was previously hinted at. 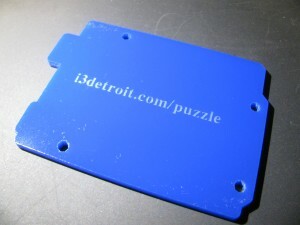 The reward for the first to finish is a month of membership at i3Detroit. Here’s where you come in: Even with a free month of membership on the line, nobody’s solved all of the steps yet! So it’s time to officially open it up to players who weren’t at the lecture. The puzzle is open to any non-member, no purchase or anything necessary, but you’ll need to be local and 18+ to claim the prize. If not, feel free to play for fun anyway! You’ll probably need to get your hands on an Arduino to solve one of the steps. If you don’t own one, perhaps you could use one at a nearby hackerspace…. https://www.i3detroit.org/wp-content/uploads/2014/03/Logo_large_png8-300x98.png 0 0 Nate Bezanson https://www.i3detroit.org/wp-content/uploads/2014/03/Logo_large_png8-300x98.png Nate Bezanson2013-04-20 21:21:352013-04-21 01:26:35Would you like to play a game?